A windsurfer who sailed across the Bristol Channel claims he did not intend to make the three-hour crossing. Adam Cowles, 24, set out from Swansea Bay and realised he had gone further than planned only when he rounded a cargo ship. The Swansea University technician decided to press on to Devon as Swansea was just a "speck" on the horizon. Coastguards said Mr Cowles could have been left stranded out to sea by a drop in the wind. Mr Cowles said people looked stunned when he walked out of the sea at Woody Bay, near Lynton, north Devon, and asked "where am I?". He then phoned his wife, Sarah, at home in Swansea so she could begin the 280-mile round trip to pick him up. Mr Cowles said he decided to press on in the direction of England after realising his starting point had all but disappeared from view. He said: "I knew something was not quite right when I noticed [Swansea] was just a speck in the far distance. "I then went past a cargo ship. I turned around and realised that I had gone too far. "It was at that point I had a moment of inspiration. I just thought I would carry on and head towards Devon. It was a clear day and I could see the coast so I just went for it. "It was quite scary because I knew that the water temperature was very cold. If I fell in I would be in serious trouble." Mr Cowles said that one of the most frightening parts of the day was having to call his wife and ask her for a lift home. However, a coastguard spokesman said Mr Cowles' unplanned crossing could have proved fatal. 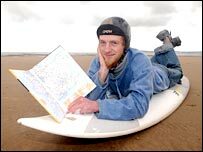 He said a lack of wind could have left him stranded in the Bristol Channel with no-one having any idea he was there.